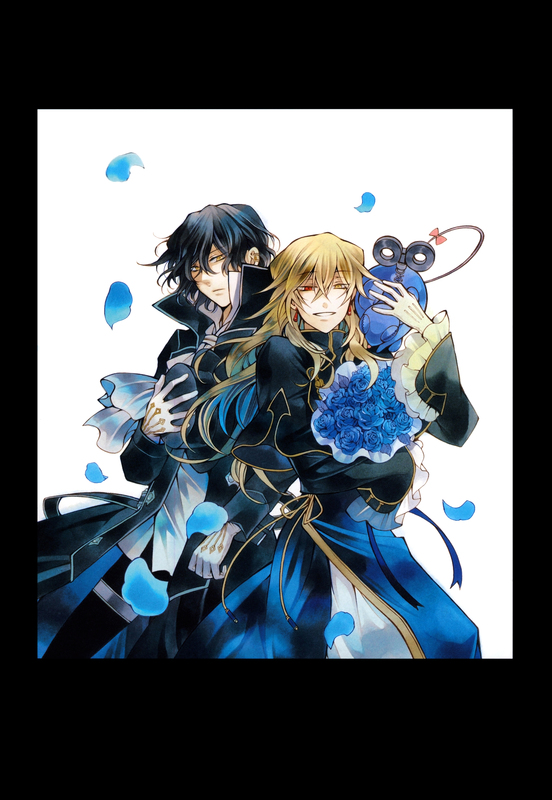 Los Personajes MAS SEXYS de Pandora Hearts Gil & Vincent y falta el Duque Barma...SUPER LINDO ESTE SCAN!...Y las Rosas Azules Le dan Un Toque Super Lindo a la IMG. uwaaaaaaaaaaaa these last scan u've been posting here r just awesoome! xD love Nightray brothers! x3 thank u a lot! The wound up mouse is interesting. yaaaay!im so glad u posted this scan!8D thx 4 sharing! Love this picture! The brothers look so beautiful together. The blue colour scheme is fantastic. Vincent is kinda a scary guy. Its easy to believe he was part of the tradgedy of sabrie. The Nigthray are the best! :D thank you for this image! Full 19 weeks ago! How ever did I manage not to see this scan!? Excuse my lateness, but thanks for sharing indeed! Very cool thnkas for shars. Anyway thankies for sharing yah~!